switch fx by pressing keys. 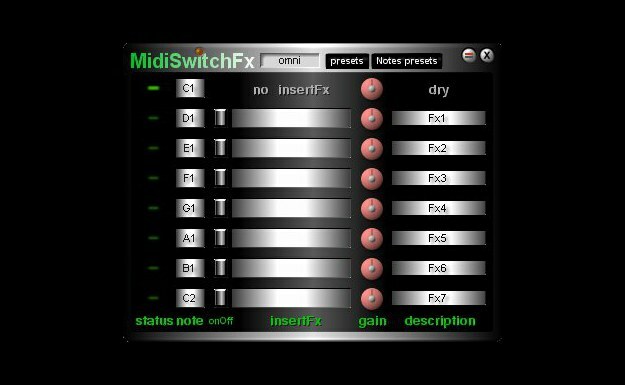 up to 7 insert fx can be loaded; notes can be assigned individually. gain settings and text (optional) for every insert. extra preset list for Note assignements. If none of the 8 assigned notes is played, the device is silent. I LOVE this type of thing! Thanks Roy, you rock! Greatly appreciated for the effect toolkit. I wish my keyboard had a "hold" feature, I guess using the arp before this would make for some sic effect 'karma'. Looks really useful for auditioning. Thnak You, the ancient MCCY versions wouldn;t work with keynotes and reuqired a modular patch Pre Switcher. Glad you have the time to share with us. oh, thanks for remembering. They served me well all the time, but this here indeed look GREAT! Only advantage of my multislots were the mono/stereo switch. Just wanted to say thanks again to a great product which I finally incorporated for Solaris. I can even use a Modular Insert to use your excellent ECC83 Low Cut/High Cut module. Here's why I love Scope DSP Platform. drop down Menu into an insert slot. to a Pitch Shifter/Delay patch for solos, then go back to Stage/Room Reverb.